Macy’s is proud to partner with those who have served our country alongside Got Your 6. This is pretty awesome as I have many friends who have and are serving our country as well as my own brother. I love celebrating those who have given so much for this country. 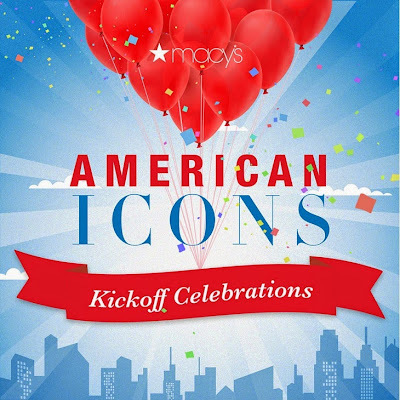 You are invited to join in for the American Icons in-store party! It is the age of the selfie so make sure to take an #AmericanSelfie while at the event! I've just started to take funny ones with the kids so it'll be exciting for them to head to the event while we are vacationing in FL. Got Your 6 is a coalition of veteran focused, non-profit partners working to help veterans make Americans stronger. Some amazing facts: In the first 2 years of the American Icons campaign, Macy's employees and customers helped raise more than $5.3 million in support of those who have served our country. Clap your hands for Macy's! I will be attending the May 16, 2015 American Icons event at Westshore Plaza in Tampa, FL. Will I see you there? When you give $3, you get an extra 25% savings all day long! This mama has some major shopping to do especially since the grandparents will be helping with the kids - wahoo! Plus, it's for an awesome campaign right? Who is ready to head to the American Icons Event at Macy's? Each location has different events so check here to see the specifics for your Macy's. 9 year old pastry chef Taylor Moxey will be preparing sweets-inspired recipes + enjoy tea from Lemon City Tea + receive a special gift when you purchase $35 or more in Home Dept. Fashion party hosted by Grasie Mercedes of StyleMeGrasie + sips and sweets. Sounds like a great event. I will see if it's coming to my area so I can check it out. This looks like such a great event that is for a fabulous cause! I hope it will be coming to where I live! How fun is that! My daughter would love it if she got to join me for this event. I'll have to look and see if there's one near me. Sounds like a fun event! I'm on my way to see if there's going to be one near us. Macy's, you rock!! Anything that can be done for our military and their families is awesome to me!! Wow that is a lot of money Macy's has raised. These parties should be awesome! I love that Macy's is doing this for our active duty & veterans! The party sounds like a great event! My son is serving as well as my SIL and my FIL is retired Air force. I can get behind anything that gives back to our veterans! Sounds like a super fun event too! Sounds awesome! I hope you had fun at the event and got some good scores! Good job giving back, Macy's!